Manila—(PHStocks)—Philippine stocks reversed their trend early this week and regain their losses Friday, 7 June, as investors start to hunt for bargains. 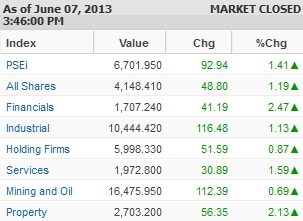 The Philippine Stock Exchange (PSE) index went up by 1.41% or 92.94 points to close the week at 6,701.95. All counters were back in the green, led by the Financials sector, which increased by 2.47%. The Property index followed, increasing by 2.13%, while the Services index gained 1.59%. The wider All Shares index, meanwhile, went up by 1.19%. Trading was slightly heavy. Value turnover reached PhP9.56 billion on 1.34 billion shares traded. There were 115 gainers against 36 losers, while 38 stocks were flat. The top active stocks were: SM Investments Corporation (SMIC, PSE: SM), Metropolitan Bank & Trust Company (Metrobank, PSE: MBT), Philippine Long Distance Telephone Co. (PLDT, PSE: TEL), GT Capital Holdings Inc. (PSE: GTCAP), Alliance Global Group Inc. (PSE: AGI), BDO Unibank Inc. (PSE: BDO), Ayala Land Inc. (PSE: ALI), SM Prime Holdings Inc. (PSE: SMPH), Aboitiz Equity Ventures Inc. (PSE: AEV), and Cosco Capital Inc. (PSE: COSCO).